We’ve talked before about general tips to keep your domains and account information safe from hackers and cybercriminals, and those topics—password strength, current email, account validation—are still relevant to protect sensitive information. That said, there is still one source of personal information you may not have considered: your domains’ Whois record. Every domain contains a Whois record, which includes information about the registrant like name, phone number, physical address, and email address. It does NOT record any financial or payment information. International rules for the governance of domain names requires that this information be collected every time a domain is registered. If you’d like to see an example, we have a Whois lookup feature to see what any domain’s record contains. The Whois record does have a useful purpose; it gives users the ability to contact a site’s administrator with any complaints, questions, or suggestions. Some may even want their information publicly available as a form of business advertisement. But for many, the security of their information may be the overriding factor. Even if you aren’t worried about identity thieves, there’s another reason you may want this information kept private. Direct mail and telemarketing firms sometimes use information from Whois records to add to their contact lists. If you’re getting direct mail, spam email, or intrusive text messages or calls, some of that may have originated from your domain’s Whois record. Fortunately, all of these above effects have an easy solution that we call ID Protect. For a nominal fee, this annually-renewable service effectively hides any personal, identifying information about you, the registrant, and replaces it with general contact information for us, the registrar. Any inquiries made about your domain are forwarded to you, without any of your information being revealed to third parties. Note that not all domain extensions can be protected by ID Protect because some registries require the information to be collected and made available. But many of the most popular TLDs qualify. So how do you check the status of your domains? Log in to your account dashboard and click on the “Manage Domains” link. You should see a list of your domains, with several columns to the right of each one. 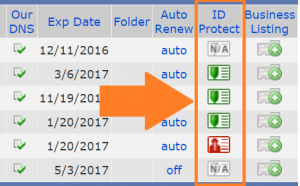 In the ID Protect column, you’ll see various icons indicating the domain’s status whether it’s already covered by ID protect (green shield), not currently covered (red silhouette), or does not qualify (N/A symbol). 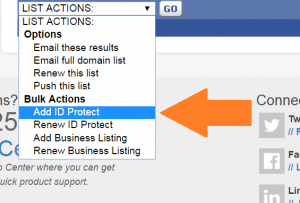 If you would like to add ID protect to a domain, check the box to the left of the domain, and click on the drop-down menu labeled “LIST ACTIONS” in the lower-left corner. Scroll down to “Add ID Protect” and then hit the “Go” button. Follow the onscreen instructions to complete the purchase of this service. As easy as adding ID Protect can be, it never hurts to ask for help, that’s why we offer several ways to get it. You can go to our Help Center, read the ID Protect FAQ, or call us at (425)-974-4689. When you’re ready,add ID Protect to all of your domains.